Reflecting Mr. Dixon's English heritage, the gardens were landscaped in the manner of an English park with open vistas adjacent to smaller, intimate formal spaces. 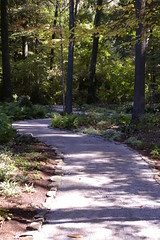 The gardens were designed to take advantage of the fine tree specimens and to preserve the integrity of the woodlands. Pathways linking different parts of the garden together reveal only a portion of the garden at any one time. The tree canopy, comprised mainly of oaks and hickories, became the framework for the garden design based upon a formal cross-axis plan. 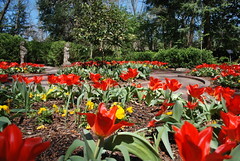 Built in 1998, the Memphis Garden Club Cutting Garden is a working flower farm with something in bloom nearly twelve months of the year. 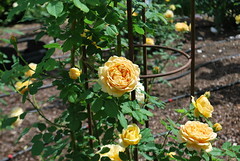 The floral arrangements you will see inside the museum are usually created from flowers grown in the Cutting Garden and greenhouse-grown flowers. 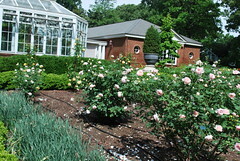 There are as many as thirty different types of plants and flowers growing at one time in this area, including displays of roses, annuals, and perennials. 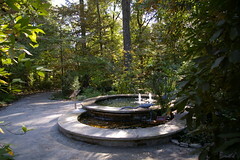 The conservatory houses the Dixon’s collection of tropical plants and the fountain, designed by Alabama sculptor Frank Fleming is an expression of the four seasons. The small slab of slate leading up to a frog sculpture was added to allow newborn frogs to climb from the fountain. 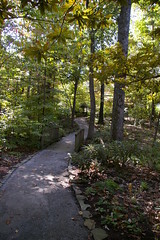 At two acres, the largest of gardens that make up the Dixon’s property, the Woodland Garden is a canopy of oaks and hickories, understory dogwoods, ferns, wildflowers and other plants native to the Mid-South. 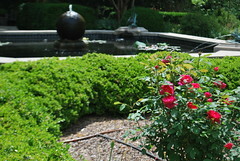 On the north side of the garden, a water feature is made up of three, ten-foot interlocking rings which illustrates the relationship between people, plants and water quality. 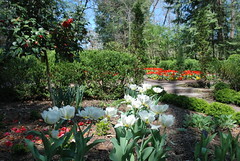 The Formal Gardens are an area of peaceful seclusion at the Dixon. Surrounded by four species of boxwood, the Formal Gardens exhibit “sacred geometry,” a design with origins in ancient Persia. 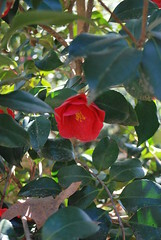 The Formal Gardens are composed of three rooms: the first, at the north end, is planted with seasonal color; the second contains a bronze planter supported by Cherubs, that the Dixons brought back from one of their travels; the third is home to two large and noteworthy Camellia japonicas which bloom red and pink and are quite old.